Every MMO has its scammers. But in EVE Online, their scams are allowed. Getting ripped off is all just part of the fun. Scams have existed almost as long as MMO games they take place in, with unscrupulous players trying all manner of trickery to wrest other players’ hard-earned in-game currency away from them. Usually, most scams are specifically disallowed by the companies that publish the games. Many companies employee Game Masters to police the “streets” of their games, restoring stolen goods and doling out punishments to those who cross the line. But not in EVE Online! 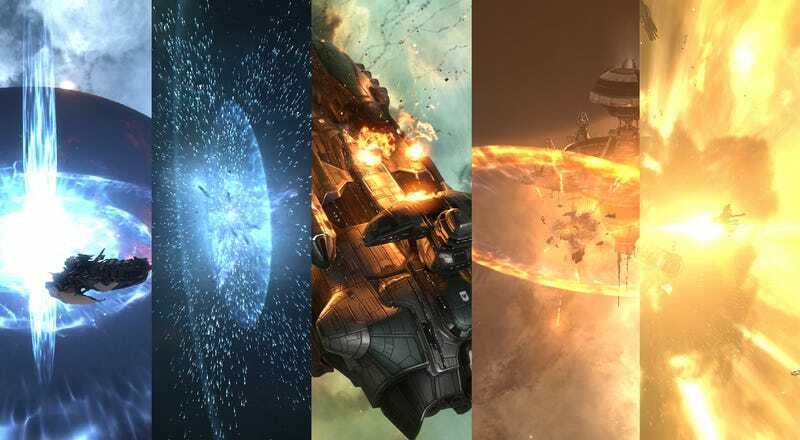 According to the game’s policy, scams that simply involve the stealing of in-game money or goods are completely legal in EVE Online. If anything, it seems like they’re even encouraged by the game’s dog-eat-dog design. The game’s main trade hub, the Jita system, has a shared chat room that is similar to the trading channels you would find in any modern MMO. But Jita chat is full of predatory players looking to fleece unsuspecting victims of all their worldly possessions. ﻿Every player that joins and stays with the game is another potential victim, and one can never have too many victims. Scams in EVE run the gamut from simple tricks—hoping that a player misses a decimal place when buying a product or service—to full-on scams based on real-life confidence schemes. A player might promise a newbie a thrilling adventure of wealth and riches in the more dangerous part of the game... one that only requires a small cash deposit from the victim in order to proceed. You can imagine what happens to that deposit. EVE is sometimes referred to as the world’s largest collaborative work of science fiction, in which almost anything you can do inside of the game’s construct is allowed. The players come together to tell the story of the entire universe, and if some of those characters are criminals and con artists, then so be it. Very few rules are put in place to moderate the interactions between players, be it on the combat grid or across the lanes of communication, and this freedom is what has spawned some of the game’s most die-hard fans. That’s not to say that there are no rules in place to protect players, especially newer ones, from losing all of their assets, some of which can have a real world monetary value. Players are not allowed to scam people in the new-player star systems, the places where the game spawns all new pilots that have just been created. Anyone caught doing any sort of scam inside of these systems is issued a ban by the game master department, the length of which is dependent on previous actions against the account. Also banned are scams that involve posing as CCP or faking an official service provided by CCP, such as anything involved with the Character Bazaar where players can buy and sell pilots. Any misrepresentation of a bought or sold character is strictly forbidden, and if a player is deceived in this area, the game masters are quick to reimburse the victim. The “decimal-place” scam. The con artist advertises ships for the low price of 1 million in-game credits, but the transaction itself is for 1 billion. They’re hoping the mark greedily clicks through without noticing. Once the transaction is over, there’s nothing the victim can do. The policy of allowing scams to run rampant inside of a game’s social structure has not been without its complaints and criticism from the playerbase. Newbies and veterans alike try to turn public opinion against the scam-friendly policies in hopes of being granted restitution by the game developers and getting their assets restored to them. However, for the lifespan of the game, CCP has not changed its policy on the subject. Updates have been made over time, adding restrictions to what constitutes a fair and legal scam as the game has matured. And, of course, some scams can backfire. Recently, members inside of the Goonswarm Federation pulled off a very high-value Corporation Recruitment Scam. This particular type of scam usually involves multiple con-men targeting either a high-value single player, or a small group of players. The would-be hustler stalks recruitment channels, watching for players who are looking for a new group to join to play the game with, once they zero in on a potential target, the game begins. Victims were led to believe they could safely jump their Supercarriers into their new home. The scammer begins chatting with the mark, talking up the corporation he belongs to and trying to convince the target that they should join. This “recruitment” process will go well for a while until the “recruiter” hits a snag; some made-up problem that throws a wrench into the process. Oh, your name came up on an old blacklist, they’ll say, or there’s a member of the leadership who doesn’t trust something about the new recruits. We can waive this with a small deposit, the “recruiter” says. This process of blockers and deposits lasts until the mark wises up, or runs out of assets. In the case of the recent recruitment scam, securing assets for profit was not actually the goal. Instead, the hustlers wanted to destroy the victim’s two Supercarrier-class spaceships, each valued at somewhere around 30 billion ISK, or roughly $500. The victims were led to believe that they could safely jump their Supercarriers into what would become their new home, and then they would be invited to join the corporation and live there as allies. But when the vessels came out of warp on top of the beacon they were told to jump to, what they found instead were a group of Dreadnaught-class siege vessels specifically set up to destroy other capital ships as quickly as possible. The victims were destroyed before they could react, much to the enjoyment of the con artists. Alongside the recruitment scam, another very common high-value scam is the Corporation Theft. Insidious players join a corporation (EVE’s version of a guild) with the sole intent of worming their way through the ranks until they are trusted with a large amount of currency or assets belonging to the corporation. Once they have the access necessary, and a plan to extract the assets, the thief takes everything that is not nailed to the hangar deck and leaves the corporation, hopefully disappearing into the emptiness of space, relatively free of consequence. Just in the last week, a player attempted this type of scam against the Goonswarm Federation’s main Corporation, GoonWaffe. After being a member in good standing of the corporation for exactly one year, the player took advantage of a program designed to help new players more easily join in on major fleet battles. The program provides these newer players with an unlimited amount of cheap but effective spaceships, ensuring that anyone new to the game is able to fly and fight for free. The mentor-turned-thief emptied the corporation’s stockpile into his own personal hangar and then immediately left to join a competing alliance.To facilitate the distribution of these ships, veteran players are inducted into a Mentor program, and given access to a hangar with hundreds of pre-built ships. Here’s where the scammer miscalculated: One thing that runs even deeper in EVE’s culture than scamming is the general love of and appreciation for new players. This is not as altruistic an emotion as it might seem: Every player that joins and stays with the game is another potential victim, and one can never have too many victims. The leadership of the competing alliance, Pandemic Horde, were contacted about the theft, and after a brief explanation of what was stolen and how, the thief was quickly removed from his new home. Word on the street is that the scammer is now blackballed by both alliances, forbidden from ever joining either one of them for the rest of his EVE career. Scamming in EVE is a long and storied tradition, dating back to the very beginnings of the games. Over the years it has taken many different forms, and inflicted much pain, suffering, mental anguish, and financial damage to many players, but every single day new scams evolve and more players fall for them. CCP’s somewhat controversial position on allowing scams to exist inside their game continues to make waves, leading to certain scammers achieving celebrity status within the community, and some becoming reviled non-persons. Players have made and lost fortunes by pitting their wits against other human beings in the virtual world. Lee Yancy (@Sarin_Blackfist)has been an avid gamer for as long as he can remember, but ever since discovering them, he has found himself almost completely absorbed in MMO style games. EVE Online and World of Warcraft dominate the majority of his time.